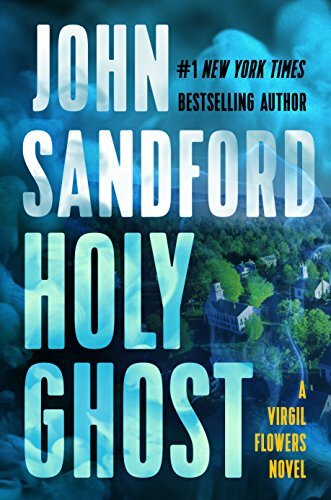 John Sandford’s Virgil Flowers novels take a different approach from his more famous “Prey” novels starring Lucas Davenport. Virgil investigates in small town and rural Minnesota, and he generally handles less horrific crimes than Davenport. But that makes the stories no less interesting, and the puzzles in Holy Ghost are plenty challenging for any reader, I’d say. Wheatfield, Minnesota was a moribund little town until the young mayor and a friend come up with a questionable scheme for reviving the economy. It involves a series of apparitions of the Virgin Mary in the local Catholic church. They mean no harm, though they certainly profit from the situation. Pretty much everyone is happy with how things are going (including a skeptical visiting priest), until somebody starts shooting at visitors. Virgil Flowers, former lady’s man (he’s now in an exclusive – though unmarried – relationship), and part-time outdoor writer, goes to Wheatfield in his capacity as an agent of the Bureau of Criminal Apprehension. He meets a series of colorful characters (described pretty much without condescension), and pokes into everybody’s business in his low-key style. These are simple people, but the mystery is not simple at all. I liked Holy Ghost the best, perhaps, of any of the books in this series. And that’s in spite of the depiction of a religious hoax, which is handled more casually than I approve of. But I liked the treatment of small-town people, and the dialogue was often quite funny. Cautions for language, dirty jokes, violence, sexual references, and lighthearted handling of religious matters.